I’ve started booking my summer schedule. I promised myself, this summer I would spend more time with the kiddos ( Enjoying our short Minnesota summer) and less time selling soap myself. I’ve decided to participate in the Dakota County Fair, and in two local markets; one in Prior Lake and one in Farmington. I love our local markets and enjoy meeting new people and sharing my natural bath and beauty products. 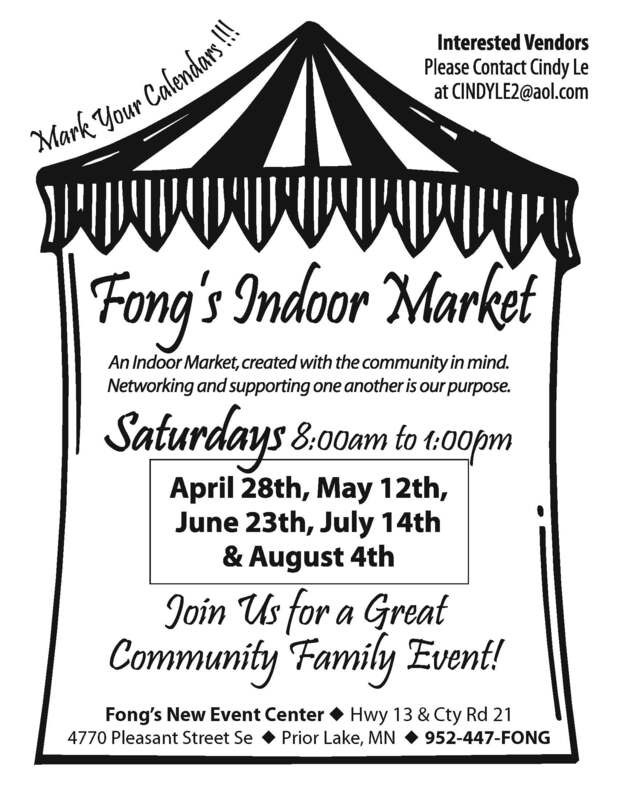 I’ll be at Fong’s Indoor Market on June 23rd, July 14th and August 4th. See the details below. And of course, I have to be in one county fair, so I chose the Dakota County Fair. It’s from August 6th – August 12th, 2012. See www.dakotacountyfair.org for more information. This entry was posted in Uncategorized and tagged body butter, cherry almond soap, cold process soap, essential oil, essential oil candles, handmade, handmade soap, lavender, lavender soap, lemongrass, lemongrass soap, natural candles, natural lip balm, natural lotion, natural soap, patchouli soap, schedule, serenade natural products, shea butter lip balm, soy candles, soy wax, wooden wick candles. Bookmark the permalink. Are you stilll in the soap business? If so, where can I find your products? Yes, I’m still in the soap business. I am currently selling at the Minneapolis Farmers Market, http://www.farmersmarketannex.com, at 200 E Lyndale Ave N, every Sat and Sunday 6:30am-1:30pm through October. You can also find a good selection of my products at the Hair Mate Salon in Prior Lake. Their address is 16203 Main Ave, Prior Lake. Plus you can order online at http://www.serenadeproducts.com. Thanks for the inquire. Have a great day!